I’ve always loved adventure, well… at least to read it, long before I learned to write it. In modern fiction, adventure has become something of a dated term. It is now more likely to be called thriller. As a compromise, I like to call my novels in this genre adventure/thrillers because that is what they actually are. They are adventures with plenty of thrills. I grew up with Tom Swift, the Hardy Boys, Nancy Drew, Buck Rogers, just to name a few of the classics. Later on, I graduated to Dane Thorson on Mars by Edgar Rice Burrows (actually more sci-fi) and then in the early seventies, discovered Kenneth Robeson, real name Lester Dent. He wrote most of the Doc Savage series. I couldn’t get enough of them! They were pulp fiction at their best mixing a lot of science fiction with rousing adventure. However, after that, there was a huge dry spell for almost two decades. It wasn’t until I was stationed at Torrejon Air Base, Spain in 1990 during Desert Storm that a book changed my life. I worked in the 410st TFW AGE shop and two hangars down, the Air Force used one hangar as a transition building for troops going from the states to the Gulf. My wife and daughters were volunteers to help run the snack bar and other services for the troops as they slept, ate, called home, or just hung out, waiting to catch the next plane to the theater. During breaks, I’d walk down to visit, talk with the troops and just mingle. They had a decent exchange library of paperback books. I had a bunch at home that I brought in and traded out. It was during one of those times that I found an old book called Raise The Titanic by this vaguely familiar author named Clive Cussler. Yeah, I’d heard of him somewhere, but his name never really clicked before. From the first page, that book blew me away. I’ve never been the same since. Old Clive has a formula. It works. He doesn’t mess with it. It’s like AC/DC. They’ve been accused of recording the same album 17 times but when I buy one of their albums, I know exactly what I’m getting. With Clive, it’s the same way. I have never been disappointed. His style just clicks with me. My Gold series is by no means a copy of Clive Cussler’s books, but they’re surely inspired by them. The six novels in the series, so far, have grown in their own direction but stay true to my own vision of what I would want as a reader. It is my sincere hope that you as my audience, will feel the same way. When I started seriously writing in 1995, I finished a sci-fi novel called The Cave. Then I tried icky bug with The Greenhouse. By then, I had a rhythm going and felt it was time to try adventure (which didn’t have to have the thriller part attached back then). The result was Lusitania Gold which I finished in early 1996. I had so much fun writing it that I continued the series for six more books over the next two decades to the exclusion of all other genres. The hero of the stories is Joseph “Detach” Datchuk. Detach is a former Navy diver that served during the Gulf War. He learned his chops in the ocean and after his discharge, caught the attention of Texas billionaire businessman Samuel “Jams” Mason. Upon the passing of Detach’s father, Jams became not only a close friend and boss, but a second father. They work together mainly on salvage operations and special undersea projects for Mason Industries, Jam’s company. When something special comes up, many times on the edges of legality, Jams allows Detach to pursue it, usually with the help of his daughter and Detach’s diving partner, Becky Mason. Along with former Russian SVR intelligence operative Vladimir Perchenskaya and his former Navy buddy, munitions expert Elroy Jones, Detach’s searches for lost treasures never go as planned. Published on August 20, 2017 by New Link Publishing, Lusitania Gold finds Detach and crew diving on the Lusitania in search of a previously unknown cache of gold. However, once they get down to the wreck of the Irish coast, they’re in for a big surprise. They discover that the ship sitting off the Old Head of Kinsale is not the Lusitania. With someone using any means necessary to try and stop them from finding out the truth, plus a mysterious shark like creature harassing them, it’ll take all of Detach’s wits and a lot of luck to get to the truth. Following a treasure map found at the beginning of Lusitania Gold, Detach heads to England in search of a treasure stolen from an obscure pirate named Captain John Harwood. The clues are vague and the trail leads them from England to the Azores and a wreck called the Pozuelo del Rey. To complicate matters, the President asks him to help search for a virologists who disappeared with a deadly virus created in a government lab. A rogue agent is also after the virologists but turns his attention on Detach and his crew. Meanwhile, Elroy becomes the target of a female serial killer. Will Detach and his crew survive long enough to find the treasure? Despite being a deep-sea diver, Detach has limnophobia, a deep-seated fear of fresh water lakes. Seismologist Max Lipton hires Detach and his crew to place an advanced design earthquake sensor in Black Lake, a sag pond on the San Andreas Fault, the same body of water that gave Detach his phobia. To sweeten the deal, Max hints that he has proof that 19th century outlaw Tiburcio Vasquez dumped his treasure in the lake. Detach confronts his fear while seeking the treasure and placing the sensor in the deepest reaches of the lake, but discovers the sensor may be a nuclear bomb designed to trigger a massive earthquake. He must stop Max from destroying Southern California to avenge the death of his wife. As a kid growing up in Palmdale, I was afraid of the “bottomless” lake and had heard the story of Vasquez dumping his gold in it. The makings of this novel has grown legs. The real lake used in the story is privately owned and though I asked permission to use it in the story, the owner did not want publicity drawn to the lake. Therefore, I had to change the name of the lake and move its location down the rift zone to public land. However, the descriptions I use throughout the story, the legends, the geology, the reality, all come from the real lake. Doing this research, I have met some wonderful people including the caretaker of the lake. While visiting an old friend in Lompoc, California, Detach is drawn into a treasure hunt for an old Spanish galleon nobody’s ever heard of that sank off nearby Point Honda. However, he stumbles across a French madman bent on drawing American into a nuclear war with China by diverting missiles from Vandenberg to mainland China. Turns out Detach can’t even take a simple vacation without getting into trouble. A pair of lame crooks kidnap Buster and Doodles, Jam’s two basset hounds. Their ransom is an ancient ring they want Detach to search for in Turkey. Detach easily catches the crooks and recovers the two bassets, but the person that hired them is much harder to pin down. Intrigued by their original ransom and with Jam’s permission, he decides to go after this ring. With security around all Mason Industries personnel tight, he doesn’t have to worry about the home front. However, tracking down the ring leads him to a deadly religious cult that will stop at nothing to get it. Geraldo Rivera had the right idea going after Al Capone’s vault. He just had the wrong location. When Elroy is kidnapped by an old time casino boss that’s down on his luck, Detach and his crew have to figure out how to spring him out. They make a surprising discovery. What they didn’t count on was North Koreans after a nuclear bomb that they think is at the bottom of Lake Mead as well as a group of terrorists out to blow up Boulder Dam. 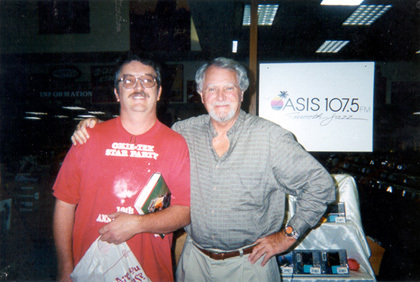 Back in the late 90’s when his book Sahara came out, I had the opportunity to meet Clive Cussler in Ft. Worth, Texas. I had worked all day at the rubber extrusion factory and had just come off the line where the ambient temperature was 155 degrees and the atmosphere was full of sulphurous rubber fumes and flocking material. During the 178 mile trip south from Frederick, Oklahoma, I got about 3o miles from the factory and noticed the back end of my 96 Dodge Dakota was acting kind of wonky. I thought I had a flat tire. I pulled off in this little border town near the Red River. Much to my surprise, the back passenger wheel was only hanging on by one loose lug nut. Of the five or six studs that were supposed to hold the wheel on, there were only two left. Luckily, there was a tractor tire shop within walking distance and the guy had a large junk drawer. I scrounged three studs, some lug nuts and was back on the road. I made it in time for the book signing. However, you will notice that, Clive has his arm around me and not the other way around. I kept my arms pretty tight to my body, afraid he’d smell me after working in the pits of hell all day! He was a really great guy and we talked about the real Cyclops, a missing ship from the Bermuda Triangle area. We also discussed the destroyers wrecked off Point Honda near Lompoc, California where I grew up for part of my formative years. Next is another of my favorite authors and a personal friend. I had the pleasure of running across a book by this “new kid” named James Rollins. Turns out he not only had a flair for adventure stories, but being a veterinarian, he also knew how to create a realistic icky bug! I first met him at the Las Vegas Writer’s Conference in 2005 and had a great time discussing everything from writing to Doc Savage. We got to meet again in 2006 and I had the honor of introducing him before his excellent presentations. We’ve kept up the occasional correspondence and whenever I’ve had any questions or comments, he has always been there for me. He is at the top of his game. He is one author that despite becoming a best seller, has not compromised his integrity and thrown out the rules. His writing has not deteriorated like some big-name authors. Before his manuscripts ever get to an editor, they see his select group of beta readers. Let me tell you, it works! When I pick up a James Rollins book, I know I’m not only getting a great story, but I’m getting quality prose. This image is from our meeting in 2006. This man is a truly great writer and cares about his fans. Finally, I have a nice photo next to a movie star! Yes, I’m standing with none other than Bob Vardeman, author extraordinaire, and a co-star of The Stink Of Flesh, an unique zombie movie out of New Mexico. 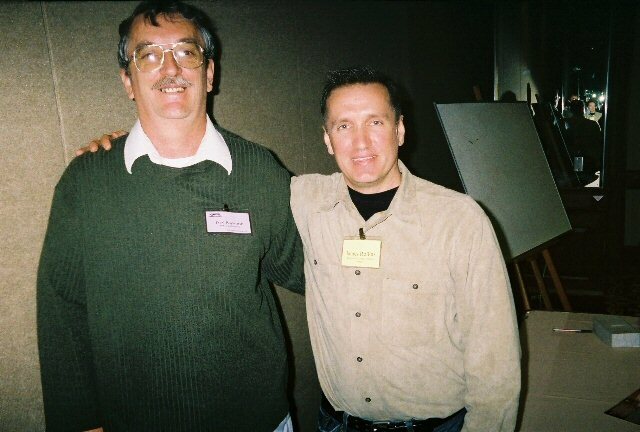 I met Bob at the 2006 Las Vegas Writer’s Conference. I’d heard of him before and knew him to be a prolific science fiction and western writer. I had no idea he was also a “movie star” until we met and he showed me this DVD for the independent zombie flick, staring Kurly Tlapoyawa and of course, Bob who unfortunately, gets eaten about halfway through the movie. Oh well… Still, a great guy and if you are into crazy and out-in-left-field zombie movies, you might want to check it out. At this time, I completed an edit of Spanish Gold. It had gone to one of my beta readers and she found a few little things which I still have to fix. I see no reason to hurry just yet since Lusitania Gold just came out. It can wait for a while. Right now I have other pans in the fire that are more urgent. Still, if the urge strikes me, I may just pull it out and get it ready for submission, once Lusitania Gold takes off. Lusitania Gold has been picked up for publishing and is going to be released August 20, 2017!